Whenever several load cells (Bending and Shear Beam type load cells in particular) are built into a scale or platform, some flexibility must be introduced into the mechanical design to allow for expansion (due to temperature) and the bending and twisting of the frames under load. If not, forces will be created between the individual load cells which could cause significant measurement errors. Typically, to overcome this, expensive ball & cup mechanism or lever/knife edges have traditionally been used. A simple, more cost effect alternative is to use a type of elastomer (rubber) bearing. An elastomer bearing typically consists of two metal plates which are held together by layer of vulcanised neoprene rubber. The SFM-3510T is a type of elastomer bearing. 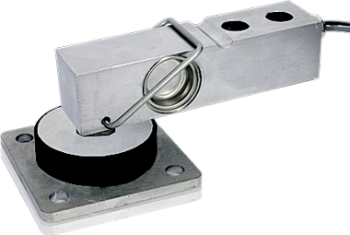 For platform applications, the rubber/metal foot SFM-3510T can be used in conjunction with the T end version of the Load Cell 3410 an Load Cell 3510. The load cell is mounted on the underside of the platform with the loading end (Live end) facing down. The foot is then clipped in place. When the platform sits on the floor the load is transferred though the domed hardened load adaptor into the load cell. The SFM-3510T has the additional feature of a flange to lock the foot to the floor. If required the whole assembly can be inverted, the rubber part of the foot providing isolation from vibration and dynamic loads.